Brisbane: Some fine pace bowling from Jhye Richardson and Pat Cummins put a dominant Australia firmly in charge after the first day of the day-night Test against Sri Lanka in Brisbane on Thursday. Newcomer Richardson took three wickets and Cummins four as the home side dismissed Sri Lanka for just 144. 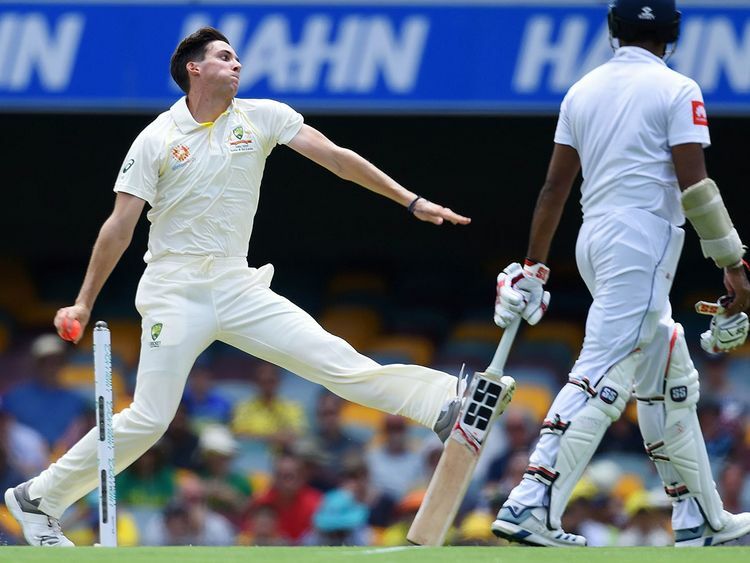 Australian opener Marcus Harris then batted assuredly to finish on 40 not out at the close of play as the home side finished the day 72 for two. Australia lost opener Joe Burns on 15 during the difficult night session to a fine outswinger from Suranga Lakmal, while Usman Khawaja (11) chopped on a ball from off-spinner Dilruwan Perera 10 minutes before the close. The only Sri Lankan batsman to show any resistance was wicketkeeper Niroshan Dickwella, who was not out on 42 at the break after a combination of resolute defence with some audacious attacking shots. He was finally rewarded with the wicket of Chandimal, well caught by a diving Joe Burns at second slip to leave the visitors at 31 for two. Mendis replaced his skipper at the crease and he and Dimuth Karunaratne fought hard to try and rebuild the visitors’ innings. Dhananjaya de Silva and Roshan Silva came and went quickly and they were in further disarray when a Cummins short ball crashed into Dilruwan Perera’s thumb, forcing the off-spinning all-rounder to retire hurt.